It was early in the morning. Liliya and I had been sleeping in the student dormitory which was connected to the cafeteria, until we moved into our new house. Typically, due to the sun rising and the birds chirping I’m awake right around 6:00 A.M, though sometimes when groups are arriving and departing at late and early hours I’m up even earlier. Stepping outside the door at quarter to seven, and I was greeted by one our Water and Wave Semester students. Water and Wave had officially ended their course the night before. Often times when people finish their course with us they spend the night in a hostel, and stick around Costa Rica to see some more sights. Other times they stay one last night with us, followed by a drop off in the airport. This case was a little different; a group of students were going bungee jumping right after the course ended. I had made an exception seeing as it was a group activity to allow her to come back onto base for the night after her course ended. This young woman had a flight very early in the morning. Unfortunately she hadn’t gotten back in time after bungee jumping the night before to make any arrangements for getting to the airport. Our drivers were not expecting to have to take her. After discovering that her flight was at 9:00 AM and it was not almost 7:00 AM, I called our Program Director Cristian Lopez from my office, who then called Mauricio, one of our logistics specialists. At 7:15 we had her stuff loaded in the back of one of the CRROBS vans and were quickly driving up the hill, towards SJO airport. This was a pretty iffy thing to do, and was really skeptical as to if it would work. Typically you need to be at the airport at least two hours before departure, especially when traveling internationally, and we were embarking straight into bumper to bumper traffic. The traffic in San Jose is terrible. I’ve been thinking they need to create a large loop like they have in major US cities. As it is right now, a driver going from point A to point B has to cut straight through heavy traffic to get there. What sort of affect a loop in San Jose would have on the ecology, commerce, etc… I can’t say for sure exactly, however I would appreciate a shorter drive to SJO. After an hour of teeth grinding traffic, and skillful maneuvering on Mauricio’s part, we arrived at San Jose International Airport with 45 minutes to spare. After getting her unloaded, I found that I had to have my passport at the gate to acquire entrance, since I did not; I wished her good luck, and happy travels. As far as I know she is the only person who I am acquainted with, to ever make an international flight with less then an hour to spare. Cross posted at Travel blogs. Some Costa Rica Outward Bound students underwater in Panama. One of our leadership students was filming. The sun comes up pretty early in the tropics, and the birds in the trees let you know that a new day has begun. It can be extremely difficult to stay in bed with the sun creeping through your curtains and the chirping of exotic birds beckoning you to wake. So every morning I arrive in the office around 7:30. Given that I don’t have any drive to work(I walk up a very steep hill), I have no qualms about starting my day early. I mean, I work in a cloud rainforest. It’s kind of hard to complain about that. Sometimes I reminisce about that Movie Office Space and the pain it takes to drive all the way to the office and back. This is not me. I walk up a hill in a rain forest and then start my day. There are some things which can be a bit surprising for my wife and I in Costa Rica. We are new transplants to the tropics, and are absolutely fascinated by all sorts of insects, plants, and animals which we encounter. Though what we found in the sink last week was something incredible, at least for us anyway. I heard a scream coming from the office kitchen. I jumped from my chair to see what was the matter. Our new Marketing Coordinator, Katie, had discovered a very large black spider in the sink. 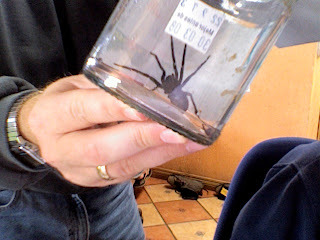 Now as creepy as this spider was, we were also absolutely fascinated by it. I took a small jar and gentley prodded her into it with a fork (Fork washed thoroughly there after). After many pictures were taken and sent to friends with the Mac computer, I let the poor arachnid out on the deck where it dropped quickly below. So no, I have no drive to the office, nor terrible winter chills to deal with, however I do have a menagerie of interesting creatures and plants which both frighten and fascinate me, on my walk to and at the office. On November 13th of 2007, my wife Liliya and I began our trip to Costa Rica. It is perhaps a misnomer when I define my activities in Costa Rica as a trip. It is in fact a job. I have been hired as the new Marketing and Communications Director for Costa Rica Rain Forrest Outward Bound (CRROBS). Our trip began early in the morning. Flying out of Minneapolis, MN we had stops in Chicago and Dallas before we made it to San Jose International Airport in Costa Rica (SJO by the airport code). Getting through the airport was easy enough. The line formed, and went way back. There was a wide variety of foreigners passing through immigration, ranging in age from late eighties to several days, and appearances ranging from the very scruffy to the sparkly clean cut. My wife and I probably would have looked more towards the scruffy side; we had been traveling for over 12 hours when we submitted our passports to the immigration official. Costa Rica has a relationship with the United States, which means that you can get your three month travel Visa upon arrival. My wife who is from Kazakhstan, and holds their light blue passport, would normally have had to apply ahead of time. However under new laws Costa Rica will accept a traveler so long as they have a valid visa to the US, Canada or EU. So she was allowed entrance with no problem as well. After claiming our luggage we stepped into the nigh air. There was a pick up arranged, but in the crowd of Taxi drivers, we had trouble seeing our CRROBS drivers. Speaking little Spanish, and not enough to politely refuse the services of a luggage jockey, he loaded our belongings on his cart, and politely waited for us to lead him to a car or taxi. Luckily our CRROBS drivers, Orlando and Mauricio, found us and took us to the truck. At this point our devoted luggage jockey followed us to the truck. It seems no one in Costa Rica is really that adept at being rude, and a proper tip for a service I didn't really want or need seemed elusive to my mind. I handed the gentleman some change which was probably about 700 Colones, or just over a dollar. Cruising down San Jose, at night was exhilarating. We had made it to our destination, luggage and documents intact on our way to the CRROBS base. I guess it’s high time I introduced myself. My name is David Roberts, but you can call me Dave. I’m the new Marketing and communications director for Costa Rica Outward Bound. Prior to this adventure in Costa Rica, I was a Peace Corps Volunteer in Kazakhstan, followed by graduate school in Vienna, Austria and USC Moore in South Carolina. All of this has been a bit of cultural learning being a guy from a small town in Minnesota. I look forward to sharing with you the happenings of Outward Bound, Costa Rica.